NEWTON MA (USA) - Caliper is pleased to announce that the 2010 U.S. Census Blocks DVD is now available for the entire United States. 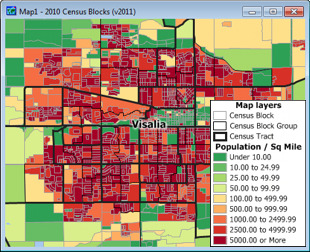 The 2010 U.S. Census Blocks Data DVD is packed with information about the US population and is essential for making accurate location-based decisions. The product has been updated to reflect the latest 2010 boundaries and US data. The DVD contains a nationwide area database with over 11 million Census Blocks and 2010 Census demographic data. Blocks are the smallest area for which the US Census Bureau collects information, and they are a subdivision of Census Block Groups and Tracts. You will be able to answer questions such as "How many potential customers live within half a mile of my store?" or "In which location should we expand our market?" Included are 2010 Census counts for 147 fields that include total population, age, gender, race and ethnicity, and also total housing units broken down by whether they are vacant or occupied. The price is US$795 and it is available online at the Caliper Store.